Hello everybody. I’ve a short podcast because I’m in America this weekend. The sound quality isn’t great so you might want to squint your ears more than usual. I rattle off a few key experiences from my time in fuggetabout it New York and then explain why Prince died. Hint: he was worshiping Wrong God. Hello everybody, Fr. Quigg here. I’m back from my emergency weekend pow wow in Camp Lowry to iron out a few of his legal issues and I’m ready to bring you the Good Word via the internet, one of Our Lord’s greatest creations. – the dangers of headbangers with regards the upcoming census. Listen, “like”, “share”, “rate” and help get the word out! Donations, if desired, below. I’m not saying it’s optional but it will decide whether or not you’re heaven bound. Hello everybody. I hope you all had a wonderful Easter full of prayer, chocolate, novenas, sweets, sacrifice and pity. This week’s sermon explores the folly of assassinating somebody to impress another person you have a crush on, the evils of the working class (particularly delivery people) and Mick Lowry accidentally filming a viral sensation. 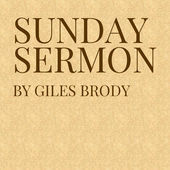 http://sundaysermonpodcast.com/wp-content/uploads/Sunday-Sermon-Podcast-March-27th.m4a Hello everybody. This Easter week is a time for reflection where we spend time with our families and think about God torturing his only son to death so we, his other children, can have unlimited credit in the casino upstairs after we’re all dead. Topics discussed this week include the Easter rising paintball war organised by the TY’s, CERN, Garry Shandling and my brilliant Easter Egg hunt. Happy Saint Patrick’s Week! On this episode of the ‘cast I’m chatting about the legend of Saint Patrick killing the man by the lake, the native American homecoming in Thurles, Enda’s visit to the White House and Ireland’s relationship with the US “Yanks”. All donations to the podcast are appreciated, expected and mandatory. Hello everybody. This week’s podcast is my first since my incident in the cinema where a priestly colleague assaulted me with a thrown shoe. I’m doing much better (thanks for the cards and the cheer up cash, which certainly did the job!) and want to stand as an example as a sort of a superhero to the people of the parish. If you throw a shoe at me, you’re actually only making me stronger so more fool you. Topics discussed this week include the hung parliament, St. Patrick’s Day and the heroes of the Rising. Here we go again folks! On this glorious day that sees Mick Lowry returned to the Dail, I reflect on his rise to glory and his place as the George Clooney of Irish politics. In an unrelated note a comedian I do not know – Giles Brody – is putting on a play in Dublin’s Smock Alley Theater on March 1st and 2nd at 9PM. It stars Edwin Sammon (Bridget & Eamon), Philippa Dunne (Diet of Worms, The Walshes), Stephen Colfer (Dreamgun) and Hannah Mamalis (Ripper Street). It’s a farce about a psychiatrist so it should be a big hit with all those headbangers up in Dublin. Episode 3 is up and it’s been another eventful week with a trip to Dublin with the TY’s to support the unveiling of Michael Lowry’s wax work in the Wax Museum. I talk about my friend Fr. Mort Jennings and his relationship with Harper Lee, whom he convinced to publish her final novel before her death. Like and share and what have you. You’re very welcome back for the latest “installment” of the Podcast! This week I discuss the mysteries of God’s love, the US election, the Valentine’s Day Massacre and the Irish election. Local gossipmongers can hear about my experiences in the Regency Hotel during the now infamous weight in/shoot out and how a certain Michael Lowry TD saved the day. Please like, subscribe and share. I’ve promised the TY’s that once we get to 100,000 subscribers I’ll buy them all a Cornetto. Hello all. Here’s the first EP. If you like it, why not download it and burn it onto a CD and then use that CD to make some cassettes for all your friends and family. Thanks to Conor O’Toole (mosshouse.org) and all the TY Students from St. Anthony’s. It’s been a long road from what began as a sarcastic remark, and now we have a wonderful podcast we can all be proud of.